Maldives: The Prime Ministers of India and Pakistan said they expected significant progress at future formal talks between the rival nations after they met on the sidelines of a summit in the Maldives. India’s Manmohan Singh and his Pakistani counterpart Yousuf Raza Gilani said their often strained bilateral ties were improving, but they declined to give a date for their next meeting. “We have today had a very extensive discussion, and we welcome some positive movement but more needs to be done," Singh told reporters at the South Asian Association for Regional Cooperation (SAARC) gathering. “The next round of talks should be far more productive and far more practical-orientated in bringing the two countries closer." 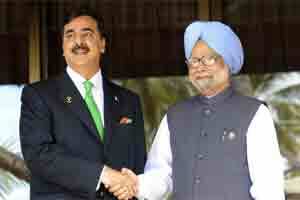 “The (Indian) prime minister has always been open and put his cards on the table," Gilani said. “The next round of talks will be more productive and open a new chapter in the history of the two countries." The leaders did not give further details of their meeting, which was held at a luxury island resort in the Indian Ocean. India and Pakistan, who have fought three wars since independence in 1947, both struck an upbeat note ahead of the SAARC summit, with officials describing the cross-border atmosphere as “considerably improved". A full peace dialogue - suspended by India after the 2008 Mumbai attacks blamed on Pakistan-based militants - was resumed in February this year. The process remains tentative with only incremental progress on issues such as trade. Last week, Pakistan’s cabinet announced it had approved a proposal giving India the status of “most favored nation" but there has been confusion since about when it will be implemented. Efforts to reduce tensions have been complicated by the increasing influence of Afghanistan in the bilateral equation. Indian involvement in Afghanistan is sensitive, with Pakistan vehemently opposed to its arch foe meddling in what it considers its backyard. Islamabad’s suspicions were fuelled when Afghanistan and India signed a strategic partnership pact last month. Afghan President Hamid Karzai is also attending the SAARC summit, along with the leaders of other member nations Bangladesh, Bhutan, the Maldives, Nepal and Sri Lanka. Maldivian President Mohamed Nasheed, who is taking over the leadership of SAARC, said he wanted India and Pakistan to shed their differences and help rejuvenate the body, which is seen by critics as an ineffectual talking shop. His office said he was keen that the two rivals resolve their issues and help release the potential of a grouping that accounts for a fifth of humanity in one of the world’s poorest regions.